Product information "Water Leak Cable Sensor"
The critical functionality of data centers and other facilities can be easily affected by water. Any type of exposure to electronics in server rooms or other facilities could lead to electrical short circuits causing catastrophic failures in equipment. Accidents caused by storms, pipes breaking or other water related problems can cause your important infrastructure to be quickly flooded within a very short time. Even if the nearest river or stream is located far from your facility tragedy can be unexpected and quick.Often social rooms, kitchens and toilets are located next to or above your server room or data center which can directly affect your critical operations if there are problems with water. These factors must be taken into account in your risk assessment solution. Server rooms and data centers are often equipped with raised floors. To be alerted reliably when water is present Didactum`s Water detection cable should be installed under these raised floors. This cable has a total length of up to 50 meters and is easily placed under the raised floor of your data center or server room. 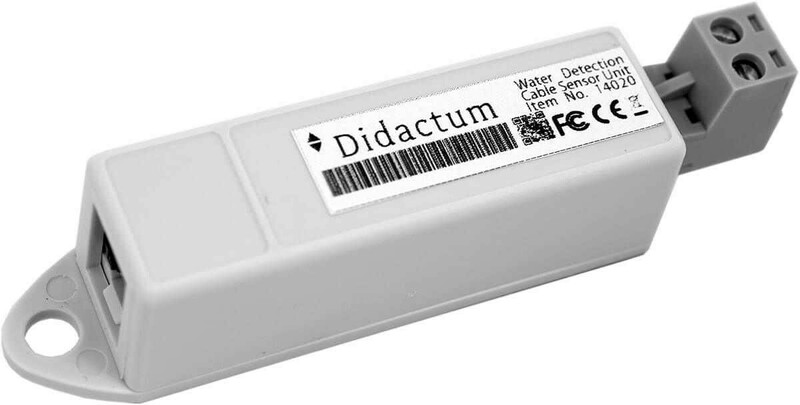 The Water detection cable is then easily connected to the Didactum Water Leak Cable sensor. The Water Leak Cable sensor is then connected to one of the eight sensor ports on the SNMP-enabled Didactum Monitoring System. Didactum`s Sensor Expansion units can also be used to conect a larger number of these Water Detection cables. Thanks to the built-in auto identification feature the Didactum Water Leak cable sensor is automatically detected by Didactum monitoring device. Then you can set the type of notification in case of flooding and water intrusion. Each Didactum remote monitoring appliance can alert you and your colleagues via E-Mail, SMS (GSM modem mandatory) or by SNMP traps to automation systems or NMS (CA Spectrum, IBM Tivoli, Nagios, OpenNMS, WhatsUp Gold, Zabbix and many more). The Didactum devices can even switch relays in case of flooding. All events are stored in syslog of the Didactum main unit. Please note that you must order the water cable separately! Related links to "Water Leak Cable Sensor"
Installation On the bottom there is a ledge with Ø 4.5 mm and height 1 mm; and a mounting hole in 50 mm from it for fastening sensor by screw 4.8×16mm. 2-pin terminal strip type TBW-5-2p with mounted water detection cable is plugged into sensor’s connector. Connection Connector RJ12 is connected to an analog input of any system unit. Determination of sensor's type and connection occur automatically. The other end of the sensor connects 2-wire water detection cable with a plug. Supply includes Sensor, cable, terminal strip type TBW-5-2p, screw 4.8×16mm, double sided sticker. Water detection cable SC-WDC 50m is ordered separately! Customer evaluation for "Water Leak Cable Sensor"